Recipe courtesy of chef Terry Myhre of the Chuckwagon Cafe. 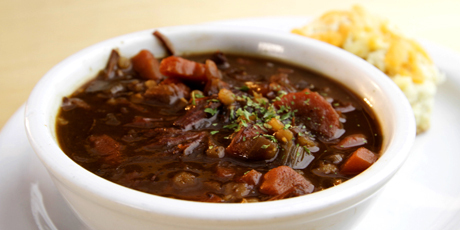 You might also like these Warm and Comforting Beef Stew Recipes. 2. Place Dutch oven on element and heat oil and butter on medium heat. 3. Add beef and bones and brown (do not crowd). Once browned, remove meat and bones. 4. Add half of the onion, celery, carrot, and garlic and sauté for approximately 10 minutes. 5. Add red wine and reduce by 50-percent or until syrupy. 6. Add beef stock, thyme, and bay leaves then cover and cook in oven for 3.5 hours. 7. Take out of oven and skim any fat that may have risen to the top. 8. Remove meat and discard bones. 9. Shred meat and return to pot. 10. Add the remaining onion, celery, carrot, garlic and the barley and return to oven for an additional 1.5 hours. 11. When finished, skim any fat that may have risen to the top and adjust seasoning to taste.